If most educators around you have already adopted the "blended" learning method in some way or the other, and you're still wondering where to being, don't worry! You may be a rookie to this new teaching style, but with the right ideas in your pocket, you're all set for your "blended classroom" goal. Blended learning usually involves the students and teachers using digital and online media for educational purposes. Students often have some degree of control over these online services or resources. Don't fret! You don't have to be tech genius to use these teaching methods! Even basic computer knowledge should suffice. 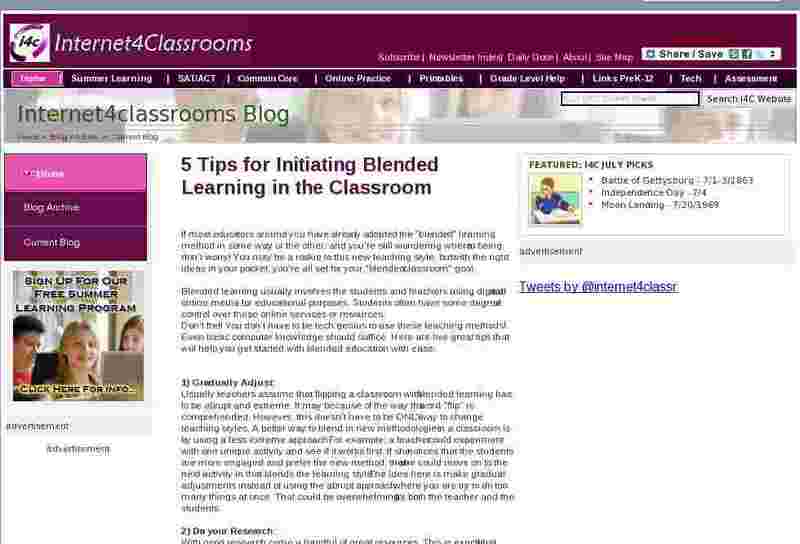 Here are five great tips that will help you get started with blended education with ease. Usually teachers assume that flipping a classroom with blended learning has to be abrupt and extreme. It may because of the way the word "flip" is comprehended. However, this doesn't have to be ONLY way to change teaching styles. A better way to blend in new methodologies in a classroom is by using a less extreme approach. For example, a teacher could experiment with one unique activity and see if it works first. If she notices that the students are more engaged and prefer the new method, then she could move on to the next activity in that blends the learning style. The idea here is make gradual adjustments instead of using the abrupt approach where you are try to do too many things at once. That could be overwhelming for both the teacher and the students. With good research come a handful of great resources. This is exactly what you need for your blended classroom: resources! Go ahead and dive through the latest techniques and tools used for blended learning. Read through material that help you determine what exactly is blended learning, how can you implement blended learning in your classroom, and other blogs dedicated to the subject that might help. Hey, you're not the only teacher who's looking for ways to implement this new teaching style. There's a high chance that your fellow teachers and other peers are also exploring new ways to get a hang of this teaching style. Don't be afraid to ask a fellow teacher for help if you feel that there's a lot you can learn from them. They might be willing to offer you helpful how-to's, tid bits, or advice on how to make the transition. When it comes to contemporary teaching styles, experimentation is the key. What may work for one teacher and his students might not be the best methodology for another. You are going to have to go through a fair amount of experimentation and seeking advice from both your peers and students before you come across the best blended learning method that works for you. Make sure you involve students in the decision making process as well. Apart from giving feedback on how well they are learning, they could be far better at using the tools are gadgets required in blended learning than you are. If need be, ask a group of students to assist you in developing the best blended strategies for your classroom for extra credit. Be warned, the transformation will require a lot of patience! At times dealing with technology can be daunting task. Don't let it kill your hopes of better teaching! Remember every mistake leads to learning. So, if one method doesn't work for you or your students, skip it and find another. Somewhere in between those mistakes and improvements, you are bound to come across a methodology that is perfect for you and your wonderfully "blended classroom". Ashley Sanford offers expert writing guidance to students from the platform of Peak dissertation service UK. She's also a sustainability enthusiast who loves spreading the awareness of "go-green" around the globe. When not working, she spends her time blogging about sustainability and educational tips.